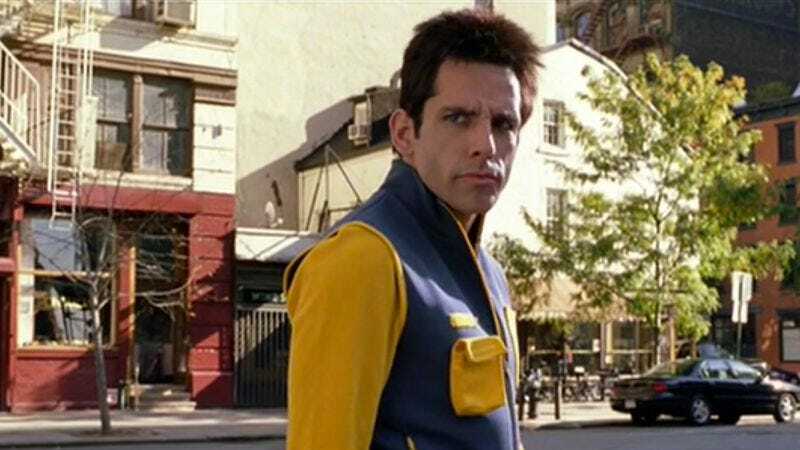 A minor gag toward the end of Ben Stiller’s 2001 oddity Zoolander epitomizes the film’s virtues—and Stiller’s, too, when his offbeat, wild-swinging style finds purchase. Time magazine reporter Matilda Jeffries (played by Stiller’s wife, Christine Taylor) is under terrible stress, having orchestrated an elaborate scheme to uncover a fashion-industry conspiracy to assassinate the prime minister of Malaysia. Her hope rests on a pair of dim-witted male models whose frustrated attempts to simply turn on a computer have resulted in an homage to the apes in 2001: A Space Odyssey. Sensing she needs some relief, Matilda’s faithful research assistant swoops over with an offering: Two hollowed-out cantaloupe halves with cottage cheese in the middle. It’s a totally random joke. The assistant has done nothing the entire movie except feed Matilda information (and the audience exposition), and none of their scenes together have been the source of much comedy. (Indeed, here and in comedies like Dodgeball, Taylor often plays the buzzkill.) But this silly, inspired non sequitur gives life to a scene that’s otherwise there just to grease the plot’s gears. As an actor and director—not to mention the co-creator and star of the groundbreaking primetime sketch-comedy series The Ben Stiller Show—Stiller sits on the opposite end of the spectrum from meticulous craftsmen like Blake Edwards or Jacques Tati. His films and roles are opportunities for improvised (or semi-improvised, or seemingly improvised) mischievousness, full of riffs that either strike some inspired bit of weirdness, or trail off into desperation. A bad Stiller film, like The Watch or the last couple of Meet The Parents sequels, can make him look like the laziest comic actor in Hollywood, someone hired to flail around in hyper-neurotic fits in a half-hearted troll for laughs. The bum Reality Bites aside, his side-winding films as director—The Cable Guy, Zoolander, and Tropic Thunder—have proved how good he can be when he’s completely engaged and in charge. None of the three are particularly smooth rides; each one snoozes through exposition and misses its share of hit-or-miss gags. But they all have an anything-goes vitality, because Stiller has the ability to pull off left-field sequences like Jim Carrey’s deranged Jefferson Airplane karaoke in The Cable Guy, or Simple Jack, the nasty parody of I Am Sam (and other such Oscar-trollers) threaded into Tropic Thunder. While sending up the narcissism and pretension of the fashion industry is akin to shooting ducks in a satirical barrel, Zoolander wisely opts for comedy that’s more absurd than cutting, starting with a conspiracy plot right out of a tacky ’60s spy film. (Think Austin Powers meets The Manchurian Candidate.) Stiller stars as Derek Zoolander, a three-time Male Model Of The Year winner—in a wonderful world where such awards shows exist—who loses his crown to the younger, fresher Hansel (Owen Wilson), a laid-back hippie type who dabbles in Eastern spirituality and keeps his loft stocked with Finnish dwarves, a Sherpa, and a personal assistant named “Ennui.” The setback has Derek thinking, “Maybe there’s a lot more to life than being really, really ridiculously good-looking.” With his career on the downward slope, Derek gets an opportunity when Mugatu (Will Farrell), a top designer, taps Derek to headline the new campaign for Derelicte, a fashion line inspired by the homeless and destitute. But Mugatu’s real mission is to train Derek to assassinate Malaysia’s new prime minister, who has vowed to establish child-labor laws, removing the cheap labor used to produce such hobo-chic garments. In spite of its barbs aimed at Third World manufacturing and the astonishing arrogance and insularity of the fashion industry, Zoolander has no satirical agenda and will make no one tremble from the force of its lash. Stiller isn’t interested in the commentary of Ready To Wear or Brüno: He takes the sins and excesses of fashion as a given, rather than an opportunity for high-handed point-scoring. A target this fat isn’t worth shooting at directly, so instead, Zoolander makes an absurdist doodle out of it, inventing a cartoon universe where male models are exalted like rock stars, and fashionistas carry so much respect and power that they’re responsible for every major political assassination of the last 200 years. Stiller sends up the vanity and empty-headedness of the professionally beautiful, but all in the service of inspired silliness, like the many names Derek gives the exact same facial expression (“Blue Steel,” “Ferrari,” “Le Tigre”) or the nonsense language of fragrance commercials. (“Moisture is the essence of wetness, and wetness is the essence of beauty.”) Or, in one of the funniest scenes, Stiller merely explores the outer reaches of human stupidity, as Derek gets as flustered by a scale model as Nigel Tufnel does with “Stonehenge” in This Is Spinal Tap. Making a movie like Zoolander hang together is virtually impossible, because Stiller’s impulse is to digress into weird little comic tangents rather than fuss over the grand design. Mugatu’s Manchurian Candidate scheme gives the film its requisite dramatic arc—and some quality backstory about Frankie Goes To Hollywood’s keytar player and the origins of the piano necktie—but Stiller remains as distractible as an ADD-afflicted child, busying himself with sketch bits, montages, malapropisms, celebrity cameos, and explorations of the vast, howling wasteland of the male-model brain. (Sample exchange between Hansel and Derek: “You can derelicte my balls, cap-i-tan.” “You think you’re too cool for school, but I can got news for you Walter Cronkite… you aren’t.”) He’s willing to trade consistency and more carefully planted comic payoffs for sequences like this one, when Derek and his male-model roomies go on an orange-mocha-frappuccino binge that turns tragically exuberant. Zoolander whiffs badly at the end, following up on a joke about The Derek Zoolander Center For Kids Who Can’t Read Good that was inspired but disposable, which neatly describes the film overall. It’s a house built without foundation, always a few bad lapses away from collapse. But Stiller turns that haphazardness into an asset: With the fashion world as a broad subject, he frees himself to go far afield without having to serve a more tightly constructed script. It helps that the highlights are so easily isolated on video—the walk-off, the frappuccino montage, the brainwashing sequence—but there isn’t enough appreciation for how much Stiller, as a director at least, is willing to risk to get a laugh. Zoolander is little more than the sum of its comic eccentricities—which happily add up to a lot.